Georgia linebacker Roquan Smith brings down Penn State quarterback Christian Hackenberg during January's TaxSlayer Bowl in Jacksonville, Fla.
ATHENS, Ga. — Whether during his time as Alabama's defensive coordinator or in his first few days as Georgia's head football coach, Kirby Smart always notices a peculiarity about the first few days of preseason camp. "So far, the freshmen have played harder and with more energy," Smart said Tuesday night in a news conference. "There is some kind of mechanism when a freshman comes in, and he has no governor. He just goes, and you tell him that you want him to stay like that, because the players who stay like that are great players." Smart cited the freshman receivers and the freshman defensive linemen for getting out of the gate in impressive fashion this week, and then he pointed out a sophomore who has maintained that "mechanism" for a second consecutive August. "Roquan Smith hasn't lost that yet," Smart said. "He just plays as hard as he can every day." The Bulldogs held their third preseason practice Wednesday, working out for two hours in shoulder pads and shorts. Smith, a 6-foot-1, 217-pound inside linebacker from Montezuma, didn't have much of an impact early last season but was noticeably improved down the stretch. His five-tackle performance against Florida was overshadowed by Georgia's offensive debacles, but his return to Jacksonville several weeks later turned heads. 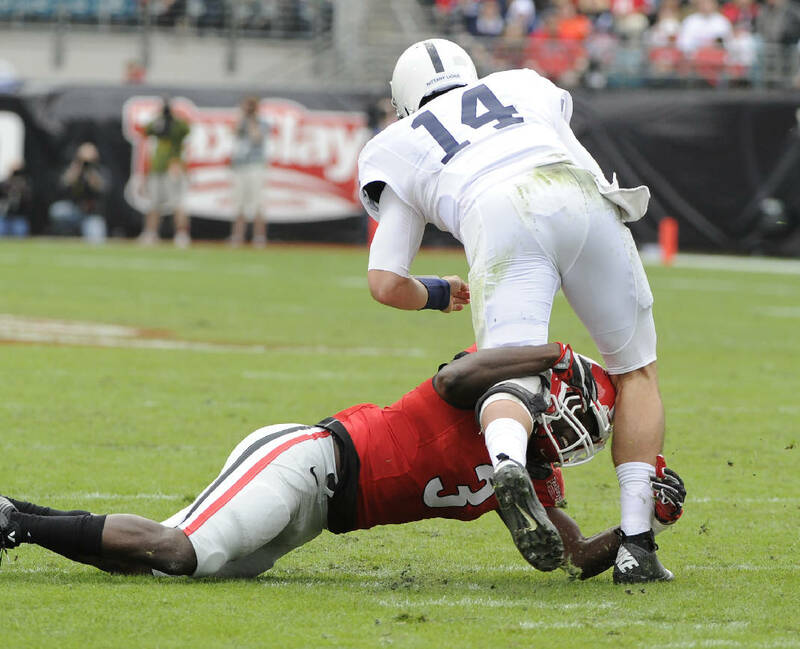 In a 24-17 win over Penn State in the TaxSlayer Bowl, Smith tallied four tackles and 1.5 tackles for loss. Georgia's two starting inside linebacker positions and the play-calling responsibilities that come with them are up for grabs this month among senior Tim Kimbrough, redshirt junior Reggie Carter, Smith and fellow sophomore Natrez Patrick. Carter played in one game last year before undergoing shoulder surgery, while Patrick was singled out by Smart this week as well for dropping 20 pounds and improving his side-to-side quickness. "All of us can make the calls for the defense," Carter said. "If you know it, you can make the call. You just have to be prepared. We go out and compete each day, and it will be up to the coaches as far as who plays." Smith is the only one of those four without a career start, but his stock certainly seems to be on the rise. He committed to UCLA last year on national signing day but never signed with the Bruins, and he immediately opened up his recruitment when UCLA defensive coordinator Jeff Ulbrich left for a vacancy with the Atlanta Falcons. Georgia became his choice several days later, and he apparently has brought noticeable energy to practice ever since. "He's playing fast out there, and that's pleasing to see," Smart said. "He's also taken on a little bit more of a leadership role." Junior tailback Nick Chubb said Wednesday night that he got wrapped up during the third preseason workout and that it "felt good." Chubb made his first media appearance in Athens since tearing knee ligaments on the first play of last year's 38-31 loss at Tennessee. "It's been a long ride," Chubb told reporters. "It's been a long journey and a long process, but I feel good about where I'm at." Chubb was asked multiple times whether he would play Sept. 3 against North Carolina but declined to make any projections.